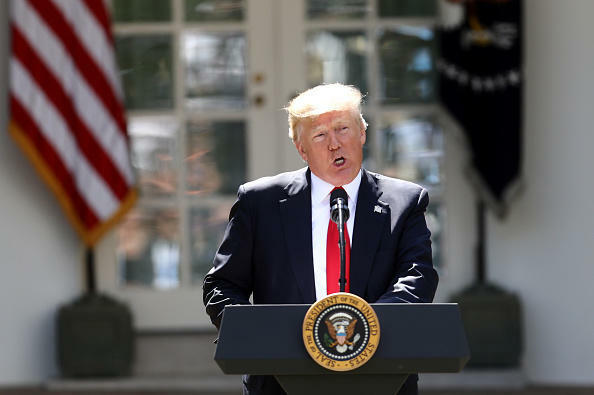 The U.S. is pulling out of the Paris climate agreement, President Trump announced Thursday in the White House Rose Garden. "In order to fulfill my solemn duty to protect America and its citizens, the United States will withdraw from the Paris climate accord," Mr. Trump said, and instead, he said that the U.S. will "begin negotiations to reenter either the Paris accord or really a entirely new transaction" on terms that he said are fair to U.S. businesses, workers and taxpayers. "So we're getting out, but we will start to negotiate and we will see if we can make a deal that's fair. And if we can, that's great, and if we can't, that's fine," he added. Pulling out of the agreement -- one of President Obama's major achievements in office -- could take up to three years to carry out. The decision was long-awaited, given that Mr. Trump promised on the campaign trail last year to withdraw from the pact. CBS News' Major Garrett confirmed Wednesday that the president was expected to pull out. The president claimed Thursday that the agreement "disadvantages" the U.S. and is "very unfair, at the highest level, to the United States." "I was elected to represent the citizens of Pittsburgh, not Paris," Mr. Trump said. He warned that the current agreement blocks the development of clean coal in America and said that the deal represents a "massive redistribution of U.S. wealth to other countries." He offered to sit down with Democratic leadership in Congress to help renegotiate a "better deal." "It's time to exit the Paris accord," Mr. Trump said, adding that it's time to pursue a new deal that protects the environment, the U.S. and its people. The U.S. will now be one of only three countries out of 197 nations that isn't signed onto the agreement, with the other two being Nicaragua and Syria. The pact is aimed at combating climate change around the world and helping nations adapt to its effects by requiring countries to present plans to reduce carbon emissions. Specifically, it requires countries to set their own targets for reducing emissions by 2020. The Obama administration, for example, had committed the U.S. to reducing carbon emissions by 26 to 28 percent by 2025. The agreement also established a $100 billion fund to help vulnerable countries deal with the effects of climate change. In a statement Thursday, Obama touted the benefits of the Paris agreement and blasted Mr. Trump's leadership. "The nations that remain in the Paris Agreement will be the nations that reap the benefits in jobs and industries created," Obama said. "I believe the United States of America should be at the front of the pack. But even in the absence of American leadership; even as this Administration joins a small handful of nations that reject the future; I'm confident that our states, cities, and businesses will step up and do even more to lead the way, and help protect for future generations the one planet we've got." Last October, Obama celebrated the news that the agreement would take effect November 4. "Today the world has officially crossed the threshold for the Paris Agreement to take effect," he said from the Rose Garden. "Today the world meets the moment and if we follow through on the commitments this Paris Agreement embodies, history may well judge it as a turning point for our planet." During the presidential campaign, Mr. Trump pledged to withdraw from the agreement, arguing at a North Dakota rally, "This agreement gives foreign bureaucrats control over how much energy we use on our land, in our country." The president has previously called climate change a "hoax," tweeting in 2012, ""The concept of global warming was created by and for the Chinese in order to make U.S. manufacturing non-competitive." Speaker Paul Ryan, R-Wisconsin, applauded the president for withdrawing from what he called a "raw deal for America," arguing that it would have "driven up the cost of energy, hitting middle-class and low-income Americans the hardest." Senate Majority Leader Mitch McConnell, R-Kentucky, also praised the move, saying that Mr. Trump has "reiterated his commitment to protecting middle class families across the country and workers throughout coal country from higher energy prices and potential job loss. Besides Obama, other key Democrats lambasted Mr. Trump for pulling out of the deal. Former Vice President Al Gore, who made the climate change documentary "An Inconvenient Truth," said that removing the U.S. from the agreement is a "reckless and indefensible action." Senate Minority Leader Chuck Schumer, D-New York, posted a tweet showing a fake cover of a newspaper. After the announcement Thursday, Tesla CEO Elon Musk followed through on his threat to leave the White House advisory councils he had been serving on.